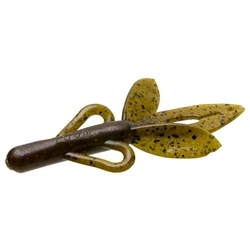 Zoom's Super Hog is one of the most versatile baits you will ever flip or pitch. With it's flat, thin tail you can definitely make a commotion without hanging up. The Super Hog's tail can even be split to create a different look and action and with its salt-impregnated super soft plastic you can surely hold the most tentative bite. *DISC* is discontinued colors that we will no longer carry. While Supplies last!